‘The Forme of Cury’ – Cookery Book – Muslim Museum UK – Uncover the 1400 year relationship between Britain and Islam. Explore the history and heritage of Muslims in Britain. 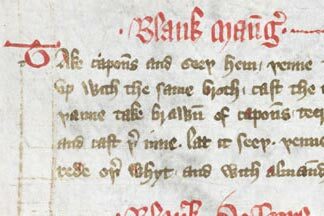 ‘The Forme of Cury’ is one of the oldest known instructive cookery manuscripts in the English Language. 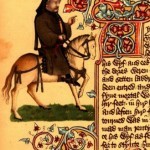 It is believed to have been written at the end of the fourteenth century by the master-cooks of Richard II (1377 – 1399). The manuscript is in the form of a scroll made of vellum – a kind of fine calfskin parchment. It contains 196 recipes. The word ‘cury’ is the Middle English word for ‘cookery’. The preamble to the manuscript explains that the work has been given the ‘assent and avysement of Maisters and phisik and of philosophie at dwelled in his court.’ (‘approval and consent of the masters of medicine and of philosophy that dwelt in his (Richard II’s) court.’) This proud acknowledgement illustrates the ancient link between medicine and the culinary arts. ‘The Forme of Cury’ is the first English text to mention olive oil, cloves, mace and gourds in relation to British food. Most of the recipes contain what were then luxurious and valuable spices: caraway, nutmeg, cardamom, ginger and pepper. There are also recipes for cooking strange and exotic animals, such as whales, cranes, curlews, herons, seals and porpoises. Some of the food and spices could have only come to England through trade from Muslim lands. The book is at the British Library. 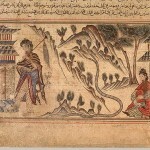 Image (c) British Library.